Our clients have always been our inspiration, our driving force to always be the best, our greatest strength. We surround ourselves with Ambitious women who raise the bar, challenge the status quo, shatter glass ceilings, break stereotypes for women to rise. To be ambitious is to relentlessly pursue excellence, to be so good at what you do that you change the game for everyone else. It is to be both strong and beautiful, courageous and feminine, fierce and sophisticated. hey babe, booking with us for the first time? Ambition Salon requires all first-time clients to fill out this form to book your appointment. This helps the artists be as prepared as possible for your future appointment. Choose One Casi Jaclyn Chardonnay Breanne Ambreen Kass Not sure! Choose for me! Example: Friends/Family, Instagram, Facebook, Google, Blogger/Influencer, etc. Ambition Salon asks that you complete this form in it's entirety to hold your appointment. All appointments require 48 hours cancellation notice via email. If cancelled within 48 hours, a $75 fee will be charged. Missed appointments without notice will be charged the full service amount. Thank you! We will review your submission and contact you as soon as possible! To book an appointment with us please call 778-809-7893, email frontdesk@ambitionsalon.ca, or fill out the form below. Preferred Artist Choose One Casi Jaclyn Chardonnay Breanne Ambreen Kass Not sure! Choose for me! Policies listed below are the rules and regulations we hold accountable to all staff & clients regarding complaints, cancellations/ no show appointments, extensions, & all matters regarding refunds. COMPLAINTS: All complaints are to be forwarded to frontdesk@ambitionsalon.ca. Any complaints placed through a stylists personal social media account will not qualify for our 7 day retouch policy. If you are unhappy with your service you have 7 days from your original service date to have it retouched complimentary. If you are unable to come back within 7 days you will be charged a fee. CANCELLATIONS / NO SHOWS: Our employees depend on you to respect their availability. All appointments require 24 hours cancellation notice via email or phone call to the salon. If cancelled within 24 hours a $75 fee will be charged. Missed appointments without notice may require a deposit for booking future appointments. REFUNDS: Ambition Salon does not offer refunds for extensions, products purchased, or services provided. Exchanges are offered on all REDKEN hair products, and we will offer to "fix" any mistakes before we offer a credit to your account with us. 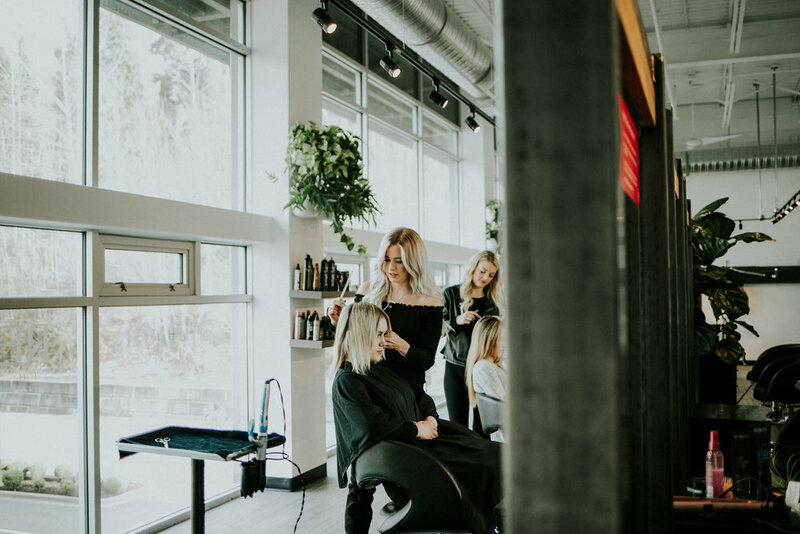 EXTENSIONS: All extensions are custom ordered and are non refundable, we require a deposit, a copy of valid photo ID, and a signed copy of the Ambition Salon Extension Contract.